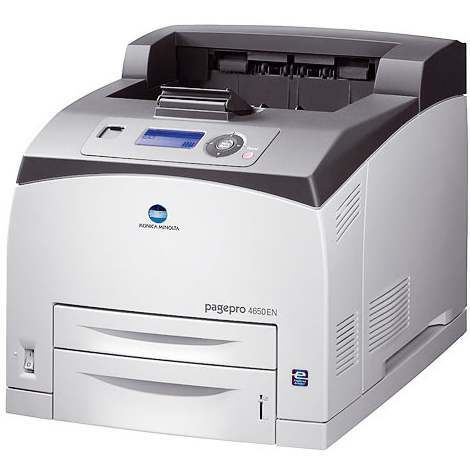 The Konica-Minolta PagePro 4650 is a workgroup laser printer that can work at a quick maximum speed of 36 pages per minute. The available 4650EN model is similar in performance, but adds an ethernet port for networking for extra connectivity. Both models are on the pricier side, as typically seen with larger multifunction models, but they have a satisfactory output quality, efficient features and high-capacity toners that are fairly inexpensive to replace. With a size of approximately 16x15x18 inches, the base model will take up a nice chunk of desktop space. The manufacturer estimates a maximum monthly duty cycle of 150,000 pages that should support large workgroups. The unit's media handling is fairly roomy as well, including 550-sheet and 150-sheet input trays, as well optional duplexing to conserve paper. Those looking to expand the printer's large-volume capabilities can increase the standard RAM of 128 MB to a maximum of 384 MB. This monochrome device meets expectations with text projects, which print with dense lines and a crisp resolution of 1200x1200 dpi using PagePro 4650 printer toner. Documents can be managed easily prior to printing with software like PageScope Web connection and the Status Monitor software allows users to manage the queue, and can display error messages and monitor Konica-Minolta 4650 toner levels. Since the model is monochrome, users only need to worry about replacing one Konica-Minolta 4650 toner cartridge at a time. 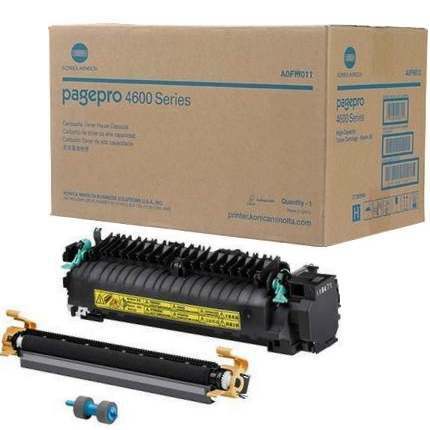 The standard PagePro 4650 toner cartridge can yield up to 10,000 pages. 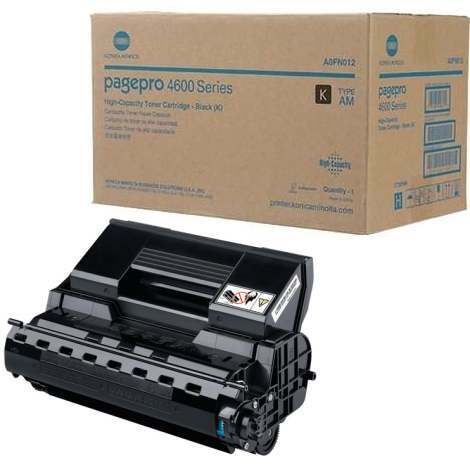 The unit also has available high-capacity Konica-Minolta 4650 toner supplies that can last up to 18,000 pages and are capable of handling workgroups with larger volumes. The 4650 is a fast, productive solution for medium workgroups, and can be expanded for more capacity. The monochrome printer also has a reliable output and networking capabilities. While it's a fairly expensive single-function machine, where users could find similarly priced multipurpose printers, the 4560 is one of the better selections in its class thanks to its affordable operating costs.